Y’all, I just looked back and it’s been 4 years since I’ve done a true update on Gracie.  That’s horrible! I can’t believe I haven’t done anymore updates, no wonder I get emails asking me about her. Now I know why! So for those that are wondering…..Gracie is doing wonderful! It truly has been a very long recovery process but she has been doing well for the past year or so. I’m not a vet, so don’t take any of what I’m about to tell you next as a medical opinion because it’s not. I’m just going to share with you what I believe helped heal Gracie. Blistering the Stifle – Back in 2013 I had her stifle blistered by Dr. Hassinger. I really do believe this helped. However, it did not cure the problem. She still would lock up occasionally after this was done. Regular Chiro Visits – Before I took her to get that done and months – years really – after this procedure, I had Dr. King (equine chiro) come out and work on Gracie regularly. For the first 2 years I would say she came out once a month to work on her. Sometimes sooner if Gracie showed any signs of a problem. Back on Track Heat Therapy Sheet – For 3 months straight, I put this sheet on Gracie every night while she was in her stall. She would wear it for 8 hours a night and then I’d turn her out during the day. I really believe this helped. 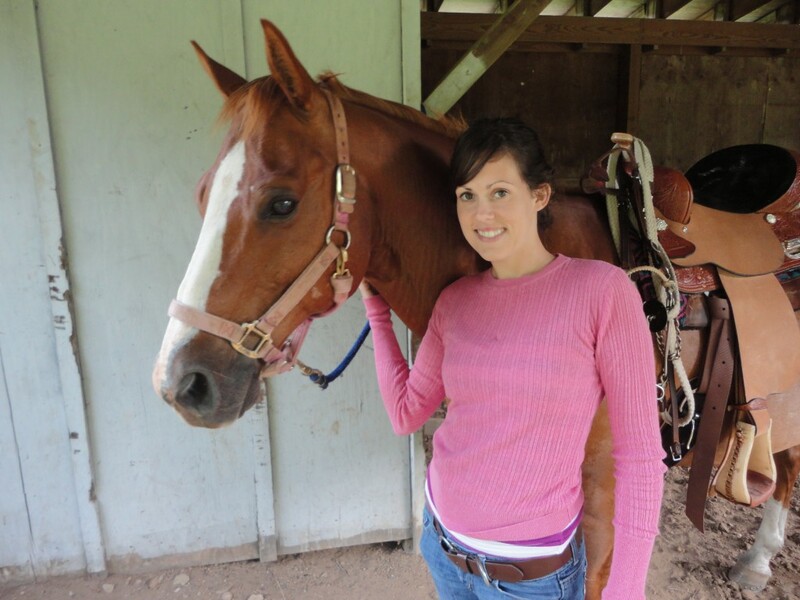 Equine Massaging – I bought the Masterson Method Massage Books and DVD so I could learn how to do massages myself. I practiced on Gracie religiously for a few months – following the books recommendation to do it 1 time a week – and I fully believed this helped as well. Riding Hills and Poles – I spent a lot of time riding up and down the hills in my pasture and doing trot poles with Gracie. Instead of focusing on getting her in shape, I focused on ways to build her hind end muscle. I fully believe it wasn’t one of these things that helped her, it was EVERYTHING. I think each thing helped to heal her in it’s own way which in the end is what got her back to 95%. She’s not 100% healed and still has some weakness in her hind end, but she rarely has problems with her stifle locking. It’s done it twice in the past 2 years and that’s been it. I do want to make sure anyone who reads this knows, Gracie’s issue wasn’t just a locking stifle. We believe she hurt her hind end as well. So when I say she’s only 95% healed, I’m not saying the stifle issue isn’t healed because it is. The only problem remaining is a slight weakness in her hind end which causes her to occasionally “dip” in her hip when she’s walking. It’s nothing that affects me riding her, although I won’t grab her out of the field and go on a trail ride if it’s been months since I’ve ridden her, but if I could keep her in shape, then there isn’t anything I wouldn’t do with her.